The first major problem mankind was faced with was how to measure time. It look thousands of years before time could be measured with some certainty. This is an amazing story, but it would take us away from our real topic : Astrology. "Astrolgy is Astronomy's daughter, and in order to feed her intelligent mother, she plays whore and sells herself to whoever wants and can afford to pay". To know how the Zodiac was created and evolved overtime, you can read a summary in the "Analysis" chapter, under the heading "Zodiac". Many religions were based on Astrology, but the religions from the Bible parted with it and the Christian religion in particular considers Astrology as a heresy. Fortunately, Western religions have lost a great deal of their influence. But many feel abandoned and look for un answer to the basic questions of Life by turning to numerous sects and mostly to Astrology. Most of those who let themselves get trapped are people with a good store of general knowledge, or even college graduates. They try to prepare their own horoscope all by themselves, hence the enormous choice of books and periodicals on that subject. Written material criticizing Astrology is rare. Rather than believing in the plain scientific truth, human beings tend to believe in mystery. "We advise the reader to play the game with us in order to avoid meaningless results and difficulties that can only be resolved when the reader agrees with the entire book content." Without going too much into detail, I will try to prove that Astrology in an ILLUSION and can even be DANGEROUS. When looking at the drawing above, one could think it is the result of complicated calculations that are incomprehensible for most people. It depicts a person's horoscope based on the day, time and place of birth. It is also called a "Radix". There are hourly horoscopes (you read the current horoscope before taking an important decision) as well as horoscopes for compagnies, governments, States or political parties. The outer ring of the Radix depicts the symbols for the 12 zodiacal constellations. You can then see the division into the 12 "Houses" where the Planets, the Sun and the Moon are located. Then you see straight lines, called "Aspects", which link the planets to each other. All that data is interpreted by the Astrologer, who takes the horoscope as the base to find the person's good and bad features, personality and talents, in order to predict that person's future. I call this the "BLA-BLA" or in english : "Gibberish". All the graphs published in this study were made based on 11607 major personalities that can be found in the "Winkler Prins" Encyclopedia (7e edition). The date and place of birth of all of them were mentioned in the Encyclopedia. Notes with regard to the Radix shown above are printed in red italic. I give more information in the following chapters, just click on the desired link ! I would like to point out that reading these will help you understand better what follows. 1. When Astrologers pretend that there are "good" and "bad" signs, it's o new type of racism. Unfortunately more and more recruiting agencies take the advice of an Astrologer into account in order to sort through applicants. The Ascendant plays a bigger and bigger role in the Astrologers' predictions (gibberish). "Favorable" Ascendants are Aries, Leo and Sagittarius ! Avoiding this problem is easy by just giving a different time of birth. In our case, the Ascendant is Capricorn, because the person was born at 8 pm. If we want to have a "favorable" Ascendant (Aries, Leo or Sagittarius) we have to mention respectively midnight, 6 am ir 6 pm ! 2. In Englandd, somme insurance companies take into account the data from a horoscope before deciding on the premium, or before acepting or rejecting an insurance policy. 3. More and more people chose to give birth by C-section at a "favorable" time of the day, in order for the baby to have a positive Ascendant. To believe in Astrology is to avoid reality and to encourage resignation and fatalism : "Its written in the stars !". Religions are used this system for centuries, and now that they finally lost their harmful power, the weak turn to another belief. 5. By all means, let's not understimate Astrologers, they are very smart and often good psychologists. After seeing them severral times, you will have told them all about your life without even realizing you did. Then later, they will "read in the stars" several major events of your life and you will be very surprised, because you will have forgotten you are the one who told them all about it. The only "ASTRONOMICAL" thing is usually the price that the "Astrologers" unscrupulously dare ask those poor people to pay. 1. Astrology cleams to be an exact science because it is taught in several Universities and Colleges in the United States. Because of the complete freedom of religion in the US, anyone can teauch anything at all, provided they get their own financing. Several religions and sects such as "The Jehovah Witnesses", the "Mormons", the "Church of Scientology", the "Moon" sect and others have huge sums of money at their disposals and often have their own "university". A university-chair does by no way mean that Astrology is a science ! 2. Astrologers compare themselves to Galileo, who was persecuted by well-known "scientists". 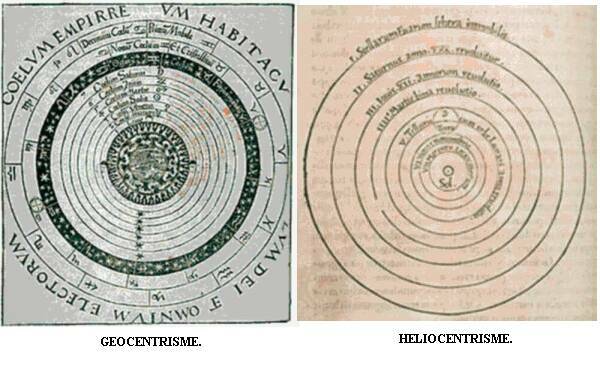 This is totally ridiculous however, as Galileo was fighting against the Church to prove the Heliocentric theory (the Sun in the center), while the Church favored the Geocentric theory (the Earth in the center) for religious reasons. Astrologers today still work based on the Geocentric theory !! 3. "The highest birth rates occur during 'full moon' periods". This statement is incorrect according to statistical data: it actually comes from midwives "experience" and their judgement is based on too small a number of births. 4. "The Sun and the Moon have a significant influence on the Earth" : nobody will deny that, but we are talking about a GENERAL influence, and no scientific experiment can prove that ther would be a specific INDIVIDUAL influence for each human being ! As such, it is obvious that planets and stars also don't have an individual influence on each humain being ! 5. Astrologers can sometime get lucky. During the presidential elections in the United States or in France, when only two candidates remain in the race, there will always be an Astrologer who will pick the winner. His colleague, who bet on the wrong horse, will soon be forgotten. 1. 192 scientists, including 19 Nobel Prizes, signed a manifesto called "The drawbacks of Astrology", published by the "Humanist'" journal in the United States. 2. The "Theodore Prize", with a payoff of 150.000  , was created several years ago and will be awarded to the first Astrologer who can prove that Astrology works. Many have already tried, without success. Mrs Greet Fransen, a famous Astrologer in Flanders (Belgium) , did a preliminary test in front of the Dutch-speaking television on February 5th 2000, and scored 1/7. In order to succeed, she should have scored 4/7 (more information can be obtained at SKEPP, Laarbeeklaan, 103, B-1090 Brussels, Belgium). 3. Several famous Astrologers have been sent the birth data of a dozen murderers, including PETIOT, a serial killer. None of them noticed anything uncommon. 4. Astrologers always claim that nobody can prove they are wrong : they are shifting the "burden of proof" ! Nobody has to show that Astrology doesn't work. BUT THE ASTROLOGERS ARE THE ONES WHO MUST PROVE THAT IT DOES WORK ! 5. MERCURY, VENUS, MARS, JUPITER andd SATURN were already known back in the Antiquity because they could be seen with the naked eye. The other three planets, URANUS, NEPTUNE and PLUTO were only discovered in 1781, 1846 and 1930, respectively. Because the position of these 3 planets - and PLUTO in particular - are taken into account today, shouldn't we consider that all previsions made prior to their discovery were inaccurate ? I wonder how the Astrologers would react if a 10th planet was discovered in the future, or if scientists decided that PLUTO is nothing but a big rock revolving around the Sun, and downgraded it into a Astero�d !!! 6. Many American Astrologers only use the Sidereal Zodiac (the good one, in other words), so they must reach different conclusions than their European colleagues, as the planets are in a different sign ! - The introduction of the Ascendant, that supposedly affects the major Constellations. - Some Astrologers even pretend that Constellations are only "reference points" to locate the planets. - Others pretend that the most important Constellation is the one that's opposite to the Constellation in which the Sun is located. In other words, they fight like cats and dogs. 8. Under the banner of "New Astrology", some Astrologers combine Western Astrology and Chinese Astrology, where each year is represented by an animal. Here again we are talking about belief and mythology ! 1. The Constellations' natural size does not match their 30� theoritical size. 2. The vernal point, which was located in ARIES 2000 years ago, is now located between PISCES and AQUARIUS. Because the "border" between two Constellations is an imaginary line, it is impossible to know where the vernal point is currently located. 3. The graphs created by the lines showing the Aspects seem accurate on paper, but they are inaccurate in space, where everything is tri-dimensional. 4. Astrologers still rely on the geocentric theory and as such, they set the Earth at the center of the Solar system and the Universe. The Greek Astronomer ARISTARQUE DE SAMOS (300 BC) already believed that the Earth revolved around the Sun : that's the HELIOCENTRIC theory. CLAUDE PTOLEMEE ( 200 AD) rejected this theory in his book "ALMAGESTE" and the Earth was once again set at the center of the Universe. 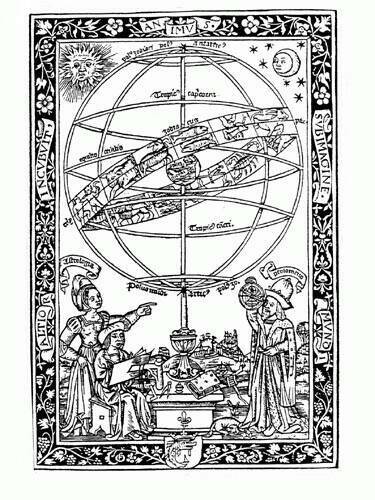 Please see the drawing below left, called "The Cosmos according to Christians and Aristotle", dating from 1521. This theory held firm until the 16th century, when it was attacked by COPERNIC and, mostly, by GALILEO. They ware brave enough to stand up for the HELIOCENTRIC theory against the Catholic Church which, for religious reasons, wanted to keep the Earth at the center of the Solar system. See the drawing below right, made by Copernic in 1543 and published after his death. 5. Astrology still considers women as "negative" and "passive" and men as "positive" and "active". This clearly proves that still today Astrology relegates women to an inferior position. The fact that so many women still believe in Astrology is therefor totally incomprehensible. 6. Children who were born in a "unfavorable" Constellation would have less chance at a successful life than those who were born under a "favorable" sign. If you look at the graph below, which is based on 11.607 major personalities, you can see that these people are spread quite evenly within the 12 Constellation. I am convinced that the spread would be near even as the number of people increases. This effectively proves there are no "bad" signs. As first sight it seems there are less people in SCORPIO, SAGITTARIUS and CAPRICORN. But this due to a decrease in the birthrate during this period from 1840 to 1920. 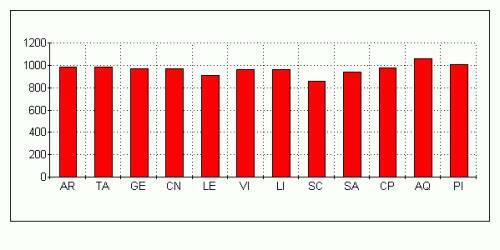 These figures were provided to me by the National Institute for Statistics (Belgium). 7. Creating a horoscope manually requires lots of time and documentation. With the appropriate software, a computer can do it in a few minutes. You will get a Radix as shown above, as well as the necessary comments (gibberish). If you ask several Astrologers for a horoscope, they will all give you the same Radix. The comments (gibberish) however, will be different, unless they all uses the same software. The trick is to introduce in the comments some facts that are applicable to most people (a big heartbreak, a move, traveling, being misunderstood, being taken advantage of, etc). The "customers" recognize themselves in some of these comments and will only remember those. The other ones - that don't apply - will soon be forgotten. 8. Astrologers are particularly good at creating horoscopes for famous personalities such as Hitler, Eichmann, Churchill, Roosevelt, Stalin, de Gaulle, Einstein, Rubinstein, Picasso, Marc Dutroux, etc. Based upon the position of stars and planets, they are able to reveal these individuals' whole personality and to explain their actions. That's working "after the fact" : is there ONE SINGLE Astrologer who is able to predict, at a baby's birth, whether he/she will become a Nobel prize winner or a serial killer ? 9. Horoscopes published in newspapers and periodicals are usually written by the editors, who take turns. They just take a "rough guess" but in really doesn't matter, as these horoscopes are worth as much as the ones created by experienced Astrologers, i.e. ZERO ! 10. It is actually very easy to prove that Astrology is nothing but a BELIEF and doesn't have any scientific basis. A weak and ignorant mankind created Gods (good and bad ones) to try explain the many disasters and answer the many questions it was confronted with. 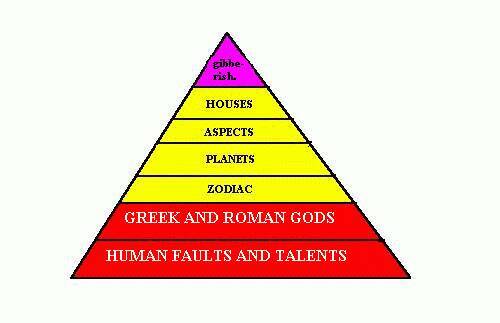 Just like human beings, these male and female Gods were talented or had faults. MANKIND CREATED GOD IN ITS OWN IMAGE. This is how Greek and Roman mythology were born. When the planets were discovered, they were named after those Gods, and they also inherited their faults or talents. Astrology is based on nothing but these facts, as shown in my pyramid below. If the two red tiers at the base of the pyramid are removec, astrology crumbles. TO BELIEVE IN ASTROLOGY IS NOTHING BUT BELIEVING IN GREEKS AND ROMAN GODS ! All the above is a SUMMARY of years of research and studies. I have choses to only mention the basic points in order to explain the mechanisms of Astrology. This web-site is a work in progress and will continue to be updated on a regular basis. It was last updated on : december 31, 2014. - "Astrologie, Zin of Onzin ?" by Ronny Martens and Tim Trachet. - "Les Charlatans du Ciel" by Alain Gillot P�tr�. - "La Mythologie de l'Astrologie" by Bart Y Bok & L.E. JEROME. You will find a bibliography of books written in Dutch at the bottom of the Dutch version of this webpage. I thank you for your attention and I hope I helped in making you think with your own brain, and becoming a FREE PERSON. One more tip : look at the sky in the morning or in the evening, and look for the real planets amid the millions of stars. It is spectacular, and maybe one day you will become an amateur astronomer !